Over the past few days, we had a few commenters asking for us to cover different brands than the big well-known performers. We have been covering a lot of new brands that have sprouted up over the past few seasons with interesting new thingss, but when it comes to some big names you don’t see here as much, the truth is that either we don’t like their bags that much, and or there isn’t much information on their bags online. We strive to give a well-rounded look at the handbag world, and I read every comment, so even if it’s only a few of you, I hear you and I’m happy to check out the brands you’ve mentioned. One brand that was included in the list of designers we leave out is Marni. I haven’t covered the brand in the past few years because there hasn’t been much happening on the bag front. Marni sort of fell off my radar. Farfetch offers a good assortment of Marni bags, and the standout of the group is the Marni Trunk Bag, which is available in different colors and variations. 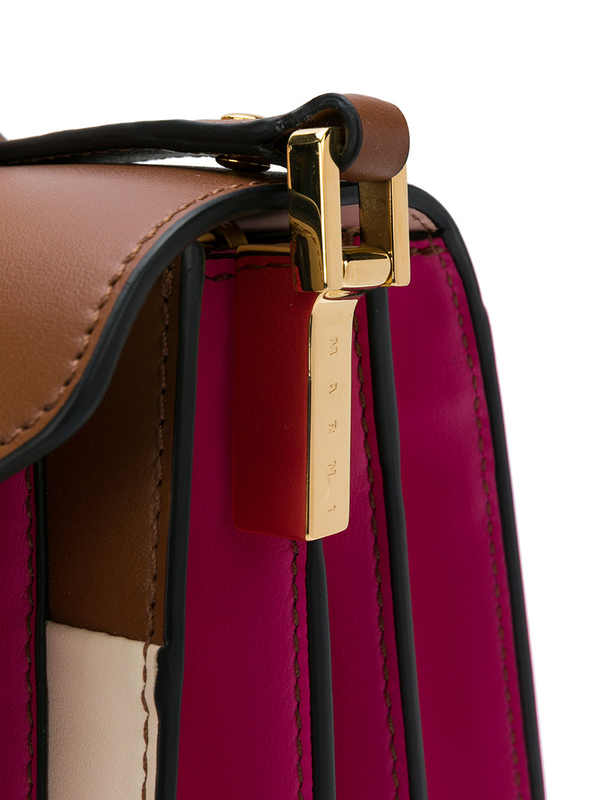 The Marni Trunk Bag has been around for many years and is really a beautiful bag. It comes in different sizes, but the classic style is incredibly usable, with its multiple interior pockets, while retaining every aspect that defines Marni as a brand; namely, being sleek, modern and minimalistic. This size in the featured image is 3.9″D x 8.7″W x 6.3″H. 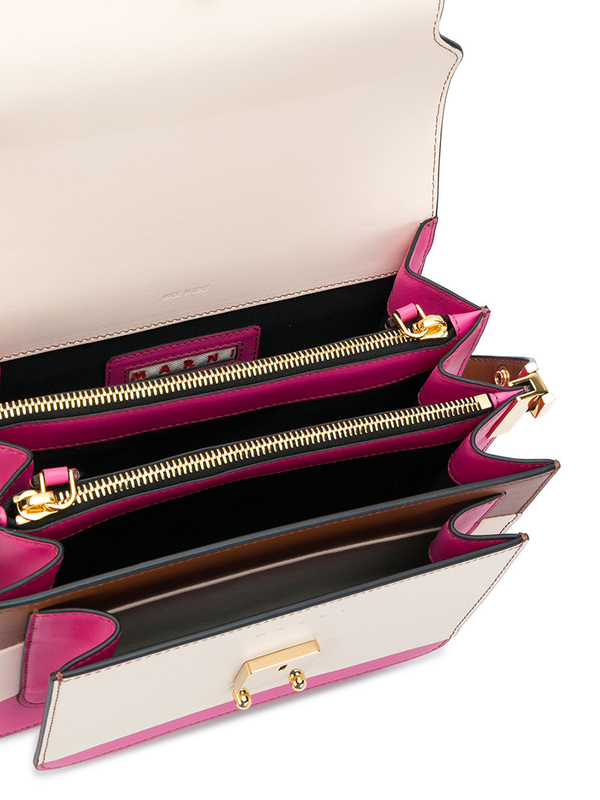 The interior has three compartments separated by two zippered compartments along with a front pouch area that the top flap closes to. I’d have to get this bag in person to see how spacious it really is when it comes to typical items, but you know I love a highly functional and planful design and this bag has it. The exterior design is simple yet really nice with the clasp closure peeking out. There are tons of options when it comes to sizes and colors, a few of my other favorites are: this pochette crossbody version, this mini pink option, this classic black with the multicolor guitar strap, and this tiny hot pink number. 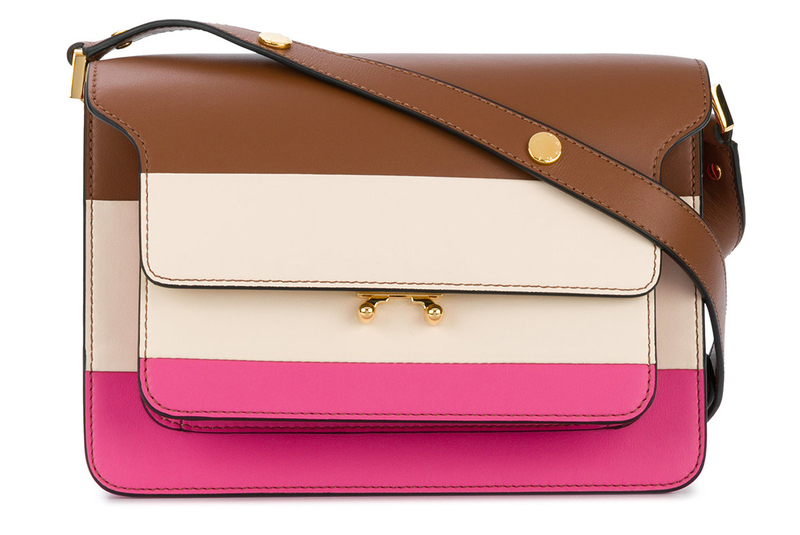 The bag I chose to feature is the ‘regular’ size in a colorblock combo that can best be described as Neapolitan Ice Cream, and that is never a bad thing in my mind. I don’t typically like brown bags, but brown with pink and cream works really nicely, and I like the fun colors on an otherwise straightforward design. If you order via Farfetch, use code A10NC to get 10% off your first. This exact bag is $$2,280 via Farfetch.